I'm well-known for "spending" other people's money ~ but even I couldn't recommend an $1,100 Nav' Ltg system. What on earth posessed you ??? The extra $500 -to -$700 (or so) you spent, would purchase a lot of "service". I have been playing around with LED's for a while now, and whilst my efforts have met with mixed success, I have not had any LED failures. The photos show my latest venture, an LED anchor light. I found the fresnel lens floating in the tide and it seemed too good not to do anything with. The light output is a lot brighter than the picture indicates. The second photo shows the LED array, which is just 6 X 3mm LEDs around a plastic tube with the soldered joints and resistors encased in a low conductivity casting resin in the centre, and therein may be my mstake. After 12 hours burning, the temperature of the resin is 32 degrees C. I have not been able to find any operating papameters for the resistors, but understand that they need to dissipate heat. Is 32 degrees C too warm for them?? No 32 is OK. A resistor can operate at temps that will burn you. However I am wondering what the temp of the resin that is in actual contact with the Resistor is, but I imagine it is OK. But do you realise that heat is also power loss. So you may want to look into other means of regulation so as you don't loose so much power in heat. I am also wondering about the big Gaps between LED's in your array. I would place at least one more LED between each you have now. You will have a very narrow focus width from each LED. An easyway to judge it is, as you trun the array around and you view into each LED, as looking into one falls from view, the next should be coming into the view. You will have ruffly about a 10 degree angle of view. That leaves you with only 5 degrees each side of centre which is not a lot. Concerning the 32 degrees, I was sure that it was O.K. It doesn't show in the photo, but I drilled a number of holes in the resin, the rationale being that it would increase the surface area and thereby improve the heat dissipation. I was able to insert a temperature probe down a hole and take my reading only millimeters away from a resistor. Regarding the spacing of the LED's, you are right in that they should be closer together, but the fresnel lens I found appears of extremely good quality (I think it came adrift from a mussel farm). Turning the light at arms length, I am unable to determine any difference in the light intensity when an LED is end on or not, which I put down to the construction of the lens. Whether the same hold true when viewed from a distance I do not know. The light draws 0.06 amps. When you come to build version No. next, maybe wrap a small piece of aluminium with a tag sticcking up out of the resin around the resistor/s. This would help wick the heat away to open air. But I would seriuosely look for a circuit with a decent regulator. Maybe tricky dickies would have something in a kit form or at least a book with a circuit. One point I did not see mentioned is that white LEDs ar actually blue or near-ultravilolet, becoming white through seconday emission via phosphor layes or similar (like fluorescent light). Possibly another failure mode is through phosphur degradation. To answer Gord's question, actually the $1100 wasn't just for the tri, but for it and three other fixtures (2 bow lights and a stern lamp). 2-300 apiece is comparable to a few other makes for complete LED fixtures. Yeah, it's stupid expensive, I agree, but the Lopolights seemed to be better built than the other ones I'd seen. In about 10-15 years, I'll tell you if I got my money's-worth! I bought a new LED bulb at the Chicago Strictly Sail boat show yesterday from MastLight.com. He had about every bulb replacment you could think of. His prices were better than the other bulbs that were there. Bea in mind that USCG certified lighting is certified and approved with a particular bulb in it. Once you replace the original bulb (especially a tungsten bulb with almost a 360-degree illumination) with something else...you are no longer certified for compliance. You might want to see how your lights look from 2-3nm away to see if the new LED fittings will perform as expected. IIRC the USCG specs only require something like a 10-20 degree vertical spread from lights, and many LEDs will make that. But a tungsten bulb far exceeds that in a decent fixture, not to mention having th 360 degree (more or less) horizontal spread against the same 10-20 degrees typical for many LEDs at the rated brightness. There are 50 LED bulbs in the unit and it is has what looks like a fernell lense covering them. He said that they would be aproved in a couple of months. The bulb is much brighter than the Davis mega light that I use now. I feel that this bulb will be a big improvment as my anchor light. I've come into this discussion very late and don't want to duplicate earlier posts. I replaced the anchor light bulb in my masthead fitting with a LED array about 12 months ago and am very happy with the result. The original was a 10 W halogen. I built an array of 12 'high brightness' white LEDs on a printed circuit board about 2" diameter. The LEDs have a 30 degree beamwidth so 12 spaced around the perimeter of the circuit board and facing outwards gives me a more or less uniform brightness in azimuth. The 30 degree beamwidth applies vertically as well, so with my light about 12 m above the water, once you get to within 24 m of my boat, the anchor light brightness is down to half. The brightness at distance is approximately the same as the original (by comparison with other lights). The big benefit for me is that the battery drain has gone from 10-12 Amp-hours per night to less than 1 A-h (very significant with my 100 A-h capacity). The array is 4 parallel strings of 3 LEDs, each string in series with a resistor to give me 20 mA at 12 V. The engine isn't usually running when the anchor light is on, but the LED current is well within spec. 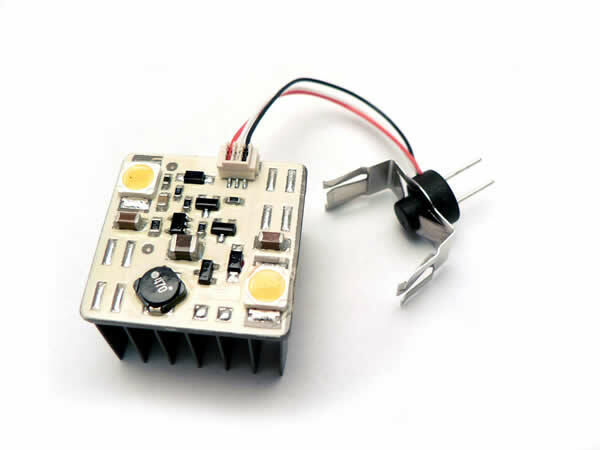 at 14 V, and at minimum voltage (10.5 V) the brightness is down to half. Of course I haven't addressed the legality of nav lights, but as an anchor light, it is streets ahead of the garden lights that many boats seem to use.